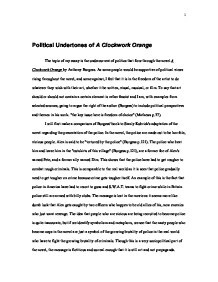 Political Undertones of A Clockwork Orange The topic of my essay is the undercurrent of politics that flow through the novel A Clockwork Orange by Anthony Burgess. As some people would be supportive of political views rising throughout the novel, and some against, I feel that it is in the freedom of the artist to do whatever they wish with their art, whether it be written, visual, musical, or film. To say that art should or should not contain a certain element is rather fascist and I am, with examples from selected sources, going to argue the right of the author (Burgess) to include political perspectives and themes in his work. "the key issue here is freedom of choice" (Mathews p.37). 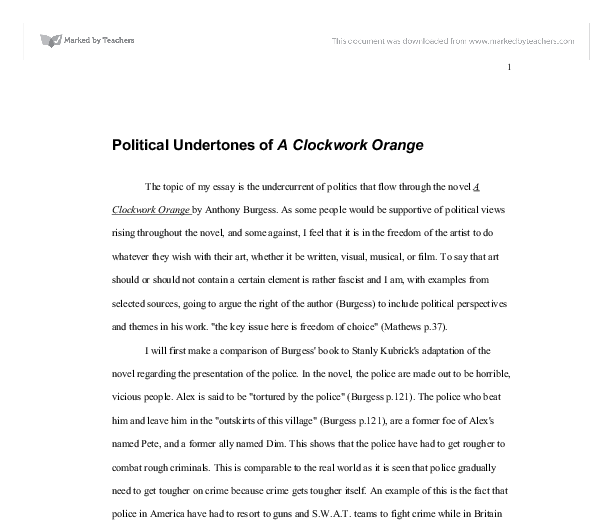 I will first make a comparison of Burgess' book to Stanly Kubrick's adaptation of the novel regarding the presentation of the police. In the novel, the police are made out to be horrible, vicious people. Alex is said to be "tortured by the police" (Burgess p.121). The police who beat him and leave him in the "outskirts of this village" (Burgess p.121), are a former foe of Alex's named Pete, and a former ally named Dim. This shows that the police have had to get rougher to combat rough criminals. ...read more. We are concerned only with cutting down crime-" (Burgess p.99). Just like many people remain weary of prison as crime control, people will criticize forced reform as well. Burgess' idea of reform comes with a schematic and arguments from both sides. To say that his book was a means of political influence is inaccurate, for if he was trying to force a political opinion on anyone the situations in the novel would be very one sided, which they are not. It is a completely unbiased delivery of his ideas. Another topic I'd like to tackle is the treatment procedures in the novel. They are in no way, or at least very little in resemblance to any sort of political propaganda. Alex had a "cap stuck on my (his) gulliver and I (he) could viddy all wires running away from it" (Burgess p.81). There was also a "dentist's chair" and all sorts of other medical goodies. The imagery of this setting brings to mind many of the horror movies produced around the middle of the 20'th century, mainly films such as Frankenstein and Bride of the Monster where a human specimen is strapped in a chair in a room surrounded by all sorts of meters and machines. ...read more. The book itself does not question the reader but forces the reader to question themselves and their surroundings. It is not a book of questions and answers but a book of situations that when read encourage the reader to create their own questions and answers. A book that asks questions is in no way a piece of propaganda, but a piece of innovative and very brilliant art if it can produce so many questions in the reader's mind. A final subject I wish to explore is the use of Russian phonetics and original Burgess catchphrases in the novel. It uses words and sayings such as "boohoohooing" that aren't part of our everyday language. The temptation I had to use words like "slooshy" or "gulliver" after reading this novel were peculiar indeed and showed to me the power of aural or written media to influence the thinking of observers. The message is very plain, subtle, and sneaky, and adds color to the mood of the novel, as well as showing the influence art and media has on people, particularly in regard to language and linguistics, which are small parts to a massive array of influences that we come in contact with every day. ...read more. and perhaps this is a result of the continual demise of his life and his treatment, the lack of confidence and recognition of his place on the social hierarchy. The character of Alex himself can certainly be seen as a device constructed by Burgess which attracts sympathy. But Alex is still tormented by his lack of choice. He becomes so tormented that he even attempts suicide. While Alex is in the hospital following his suicide attempt, the tragedy of his oppression is highly publicized. In an attempt to stop public criticism, the state "fixes" Alex. Burgess builds this up to a climax and instantly shatters the faith and preconceptions we had had. This makes us cautious of characters and in this chapter after the letdown Alex received from Dr Brodsky and Dr Branom, we do not want Alex or ourselves as the audience to trust the discharge officer. The movie never directly states what is in the milk, yet after drinking it, the droogs all seem very excited and almost imagining their environment. This leads one to believe that there was some type of an amphetamine or hallucinogen because the amphetamine would cause an "increase in energy and alertness" while the hallucinogens caused a "sensory distortion" (Kalat 94). Alex lives in a world with people who are so willing to conform and are not interested to learn or educate themselves outside the state they live in and when he sees this man who is reading various books, it intrigues Alex.